Artificial intelligence (AI) and machine learning are the next big technologies to promise huge improvements to the way enterprises function. The hope is that embedding these technologies into everyday processes and applications like customer service, sales and security can make them more automated and efficient. 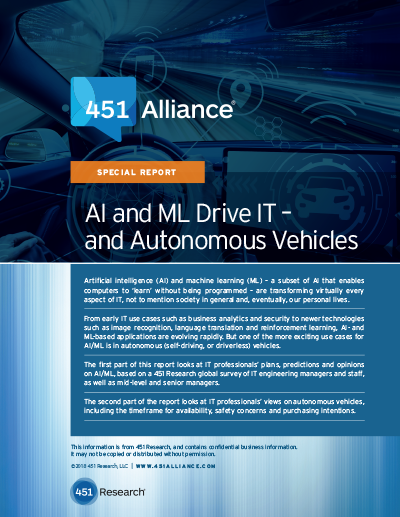 In looking to quantify the impact of these technologies, 451 Research surveyed the IT think tank, 451 Alliance, to examine AI adoption patterns and their benefits, barriers and applications. 451 Alliance members reported favorably on AI technologies, citing new efficiencies and improvements in key business functions. However, we’ve also seen growing demand for more niche, industry-specific AI applications. Let’s look at how four industry sectors – financial services, retail, healthcare and manufacturing – are embracing AI and machine learning. In the financial services sector, security seems to be the primary deployment goal for AI, with 42% of survey respondents saying they are using machine learning for fraud detection. Digital and data security was also a popular response with this group. These responses make sense in an industry with such a focus on regulation and compliance. With so many historical transactions to learn from, machine learning is an obvious answer to the fraud-detection challenge. Looking ahead, compliance and payment processing are the two most anticipated use cases for AI in the financial sector. With its ability to uncover patterns in large datasets, machine learning is an obvious match for rooting out irregularities with compliance. The name of the game in retail is creating repeat customers, and machine learning is helping the cause. Forty-five percent (45%) of Alliance members from the retail sector say they’re turning to ML to improve customer engagement. You’ll notice a common theme here: Retailers are able to use this technology to identify patterns out of mountains of transaction data in order to best target their customers. Looking ahead, expect to see retail organizations using AI for product design and creation and post-sales customer service. Machine learning promises big changes in the healthcare industry – many noticeable to frontline practitioners and patients. Forty-six percent (46%) of Alliance members in healthcare say they’re using machine learning in their patient monitoring systems. Coming in second is clinician workflow optimization. The goal with these technologies is to allow clinicians to focus on the higher-level decision-making that improves patient outcomes rather than getting bogged down in the minutiae of patient data they have at their fingertips. Other use cases on the rise in the healthcare industry include operations management, treatment development, and disease diagnosis and analysis. Looking at the manufacturing industry, maintenance forecasting is the most popular use case for machine learning today, cited by 36% of respondents. The popularity of forecasting support shows the value that machine learning can bring in terms of making predictions about complex systems. Predictive maintenance can help reduce machine downtime, lowering costs and improving margins. Machine learning is also helping in the manufacturing industry with supply and demand forecasting, which is also having a positive impact on margins for manufacturing organizations. Do you have your finger on the pulse of tech trends? Join the 451 Alliance for exclusive research content on industry-wide IT advancements. Do I qualify? Next How Will the Midmarket Manage the Migration to the Cloud?